We are committed to providing a high standard quality service to all our customers, but understand that sometimes you may wish to complain about an aspect of our service or bring to our attention something that is not working well. If you have a complaint which cannot be dealt with by the member of staff you would usually deal with, we have a complaints procedure in place. This aims to deal with your complaint effectively and efficiently. Complaints can be made by phone, in person at Coastline House, by letter or complaints form, or directly using the complaints form on this website. Alternatively, it may be possible for a Tenancy Management Coordinator to meet you in your home. Our full complaints policy is available on our policies page. Each year we ensure that we feed back information about complaints received to all our customers. 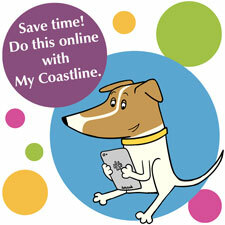 This can be found in CoastLines magazine and our Annual Report to customers. When we do things well, our customers often pay us compliments about our work. It's always great to get positive feedback and our staff really appreciate it. We record all your compliments, so if you think we have done something very well or a member of our team has gone that extra mile to help, please let us know. Letter from customer: “Keith Dunstan spent a lot of time taking me step by step through the process and everything happened just as he told me. I can't thank him enough for what he did. The men from CSL who came to do the work were wonderful, they kept me informed when they would make a noise or there would be dust or the toilet would be out of action. And Mark was wonderful too as he arranged for a non slip floor in the kitchen which has made such a difference. Both the bathroom and kitchen flooring have changed my life completely. I want to say a huge thank you to all of you for making my life so much easier. I couldn't be happier and the process from start to finish was painless.